LG-57, Lower Ground Floor, SSTwo Mall, 40 Jalan SS2/72, 47301 Petaling Jaya, Selangor. Part of the Grumps chain. 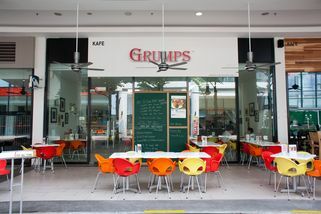 Grumps is located at two places: SSTwo Mall and at Kelana Jaya. 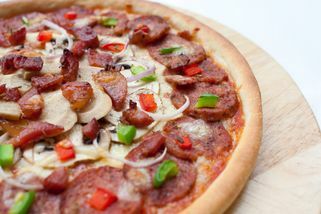 It is a blend of Italian as well as German cuisine, offering dishes such as pork knuckles, pizza, lasagna, pasta, and much more. 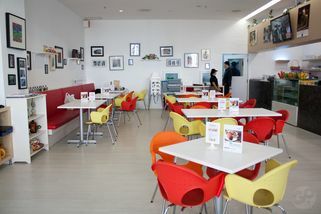 The restaurants feature a clean, bright, and airy atmosphere that’s distinct from one another. The SStwo Mall location has a new-age, modern interior and feel. It is located at the courtyard, so there are tables and chairs right at the courtyard for people to dine at. It’s also very peaceful and quiet out there, with trees and plants surrounding the courtyard. Grumps has a great selection of pork-based dishes. 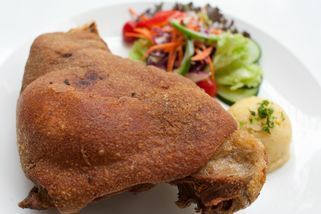 For instance, their pork knuckles is their signature dish—it is served with some salad and 2 types of dressing. 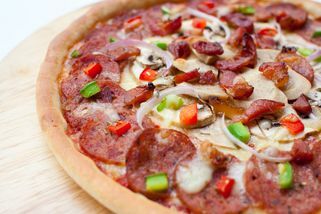 Other dishes that feature pork are their lasagna and Italian combo pizza, which has both pork pepperoni and bacon bits. Grumps also has lots of seafood dishes such as seafood pasta, grilled fish, and much more for those who prefer to have seafood. Friday night!! Time to hang out with friends.. 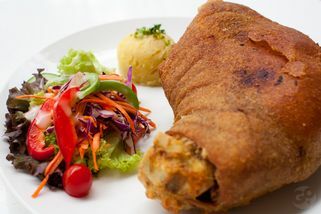 When we saw on the menu, firstly is attract by the food picture. 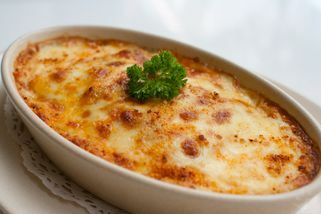 The Pork Lasagna seen like so delicious and also got chef' recommend mark. We order the Pork Lasagna and Pork Knuckles, also cannot less the Salad to make our dinner more balance. I like the Pork Knuckles, its so crispy (Maybe I like the fried food). Have no any doubt the Pork Lasagna, but need eat finish when its still hot. Because when its already become cold, that will be a bit oily. At last, we order dessert (no dessert, not complete)- Chocolate brownie with ice cream cake. I don't know maybe is last call (last call around 9.45pm), there put a lot of chocolate sauce around the brownie. Well, the decorate not make me feel delicious. Even its last call, the decoration cannot so unceremonious. My family and I tried some of their pastas and a pizza... it was average. The pizza was kinda soggy, which is never a good sign in my parents' review books. They absolutely hate soggy pizza. The pasta was a bit better, but also nothing special... The prices are pretty reasonable, so it's worth a try. Guess I should try out their pork knuckles next time since it's the specialty.. maybe that would taste awesome!